If horror films were like baseball (and there have actually been a couple of baseball horror films, by the way), then Jordan Peele would have unanimously won the Rookie of the Year Award in 2017 for his directorial debut, Get Out. Not only did the film receive rave reviews from critics, it amassed a stellar $176 million at the U.S./Canadian box office and over $255M worldwide, against a miniscule $4.5M budget. 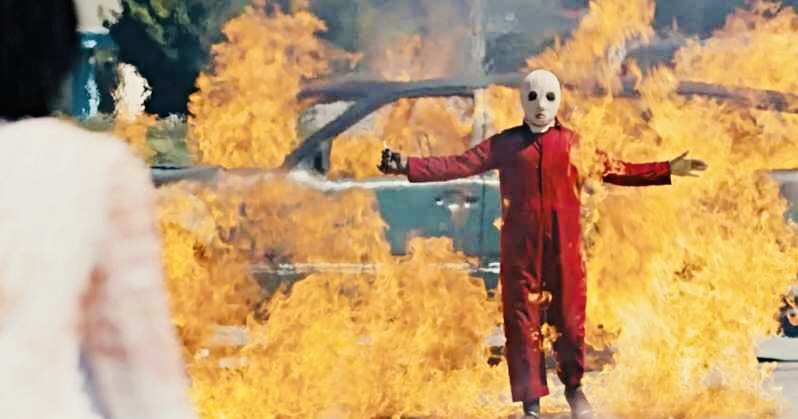 The film, which dealt with issues of race in today’s world (read the Gore 4 review here), went on to pick up four Academy Award nominations, including Best Picture, ultimately winning Best Screenplay for Peele’s original work. So, just like with fans and sportswriters looking forward to seeing how an All-Star rookie fares in his next season, moviegoers and critics anxiously waited with great anticipation for what Peele (previously known before Get Out for his comedic work in shows like Key and Peele), would come up with for his sophomore effort. Proving he was no flash-in-the-pan, one-hit-wonder, Peele delivers once again with Us. Us begins with a little girl straying from her family, as little kids are wont to do, while at a carnival in Santa Cruz. Upon entering a scary funhouse, she eventually encounters a frightening look-alike version of herself. This event traumatizes the little girl to where she stops talking, and her parents are told to tap into her creativity by encouraging her to write, draw or dance. Cut to modern day, and the little girl, Adelaide (Lupita Nyong’o) is all grown up with a family of her own – husband Gabe (Winston Duke), daughter Zora (Shahadi Wright Joseph) and son Jason (Evan Alex). The Wilson family are vacationing at their beach house in Santa Cruz, which has Adelaide understandably apprehensive. That concern soon comes to fruition when a strange family of four suddenly appear outside their house. What’s even stranger, is that this family appear to be virtual dopplegangers of the Wilsons. While they may look the same, they act much different, with the son’s double scuttling around on all fours, and all but Adelaide’s double basically mute other than cries, screams and yells. The Wilsons find themselves under attack by this other family, which brandishes deadly scissors and seems determined to stop anyone who gets in their way. As Adelaide struggles to protect her family, she comes face to face with the mystery that began for her years ago. Us is an intense, frightening, horrific tale with ambitious concepts and startling images. It explores our duality as human beings, as we all possess a darker side to ourselves, which most of us, hopefully, while understanding that it does exist, are able to keep it at bay. Peele has said he wanted to examine the “guilt and sins we bury deep within ourselves.” Certainly, these themes have been explored in literature and film before, from Dr. Jekyll and Mr. Hyde and The Hulk to Dracula and American Psycho. Peele is also channeling famed psychologist Carl Jung, who stated, “Every good quality has its bad side, and nothing that is good can come into the world without directly producing a corresponding evil.” Jung also spoke of the ‘shadow’ or ‘Id,’ which referred to “an unconscious aspect of the personality which the conscious ego does not identify in itself.” That Peele is able to tackle such previously explored subjects and make it seem entirely fresh and unlike anything we’ve seen before is a testament to his skill as a screenwriter and director. In addition, the concept of the doppleganger is one that has appeared in film throughout history, and frequently within the horror genre. Invasion of the Body Snatchers, The Stepford Wives and John Carpenter’s The Thing are some of the most notable examples where people find themselves at odds with others looking to take their place in the world. Much like with the rules associated with time travel and paradoxes, two of the same being cannot occupy the same space. That naturally creates a conflict to say the least, where the old must fend off against the new and only one can be left standing in the end. Peele takes that idea and makes it his own, giving each family member the chance to take on their opposite. Leading that charge is Oscar-winning actress, Lupita Nyong’o. Her Adelaide is at once petrified with fear while also managing to summon the strength to protect her family no matter what it takes. That duality is coupled with her doppleganger, Red, who is not only vicious and terrifying, but is able to evoke sympathy to some extent as well. Once you hear her speak in her slow, throaty tone of voice, you will not soon forget it. While Lupita is terrific in everything she is in, this dual performance is one that should be remembered come Oscar time. Winston Duke, best known for last year’s gargantuan hit, Black Panther, plays the dad role to a splendid tee, and also adds some levity to the proceedings. 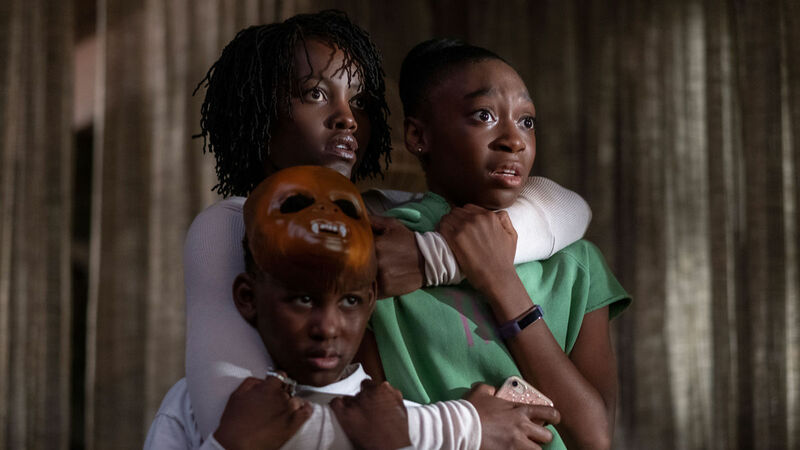 And Shahadi Wright Joseph and Evan Alex more than hold up their ends, as the resourceful kids and their creepy and deadly counterparts. Kudos also to cinematographer, Mike Gioulakis, for his inventive, effective camerawork, which utilizes everything from long, slow push-ins to slow-motion. Having previously shot John Dies at the End, It Follows and M. Night Shyamalan’s last two features, Split and Glass, he’s racking up some impressive genre credits. 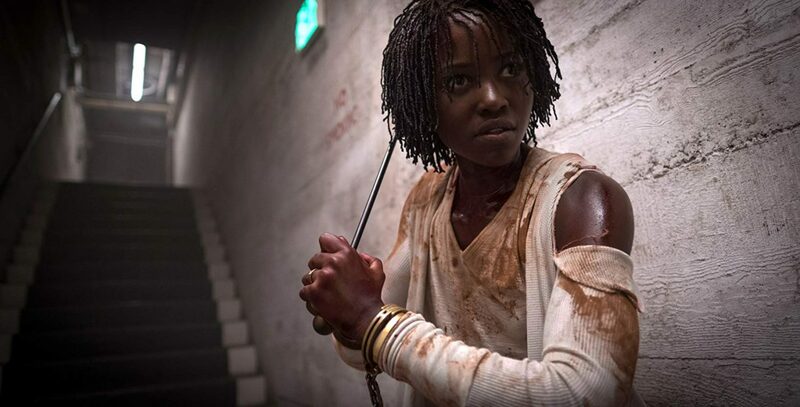 With Get Out and now Us, it’s not too soon to declare Jordan Peele a modern day Master of Horror, the exclusive club begat by legendary filmmaker Mick Garris, and which has included the likes of George Romero, Wes Craven, Tobe Hooper, Joe Dante, John Landis and Don Coscarelli. With his added duties as host of the newly resurrected The Twilight Zone on CBS All Access, Peele deserves access to this exclusive and worthy unofficial club. His love of the horror genre is evident not only in the type of films he’s doing, but within those films themselves, with references to Jaws and C.H.U.D. just two of the most noticeable ones here. Horror is hotter than ever at the box office, but it can’t sustain itself with remakes, reboots and sequels like Halloween and It. 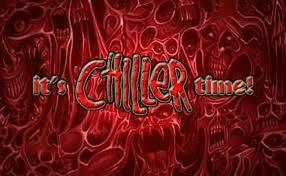 The genre always needs fresh, new blood to keep it alive and well. It also should be pointed out how refreshing it is to see an African-American family as the leads to a major motion picture of this type. Thankfully, with Jordan Peele around, we can expect plenty more, exciting, original genre fare with compelling casts in the years to come. 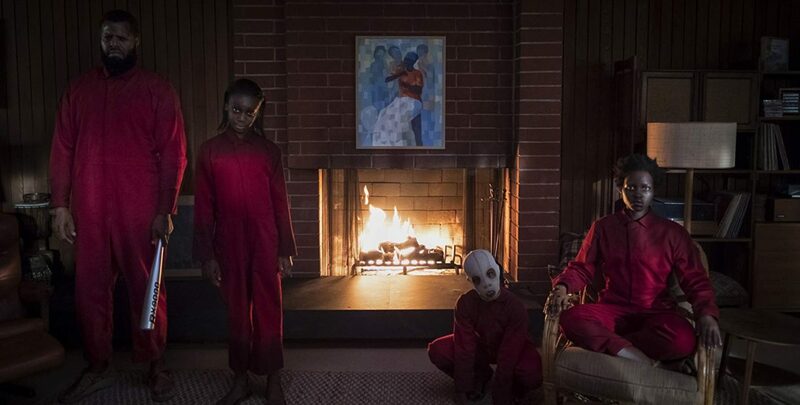 For a deeper look into the film, Us, including an exclusive interview with Peele himself, check out the latest issue of Fangoria magazine, where you can subscribe here. In the meantime, beware the next time you look in the mirror, because you may not like what you see! I really enjoyed reading this amazing review of the movie, US….. it gave major detail about the movie, that I enjoyed reading from this great review from Brian de Castro. Thanks for the kind words, Sharon. Much appreciated. And go see Us when you get the chance!